This week's store has a very colorful history. Want to hear it? You don't? Honestly? It's a really nice story. No? Really? Well that's too bad, because I'm gonna tell it anyway. Once upon a time there were two bees. Yep, two insignificant little bees. Not letter B's, but actual insects. They were very good friends (they share flowers and honey, like all good friendly bees.) and they were very enterprising too. So enterprising in fact, that they decided to put up their own business. They actually put up a restaurant/sari-sari store, and it really took off, I mean really stung the public (he he he). Unfortunately, they didn't agree on certain things. One bee wanted a restaurant, while the other bee wanted a general store (not a store selling generals, but a store selling stuff in general. Was that clear or what?) And so sadly, they had to part ways. 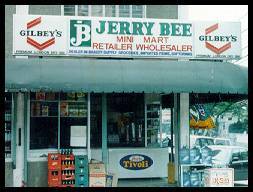 One of the bees, who was named Jolly (which is a funny name for a bee, since I haven't seen a bee actually happy, what with all that honey they need to collect), went off and started the most successful fast food chain in the country.